It is a beautiful day here in Boston today. I took a walk and happened upon a neighborhood yard sale- very unusual for a weekend in March in New England. The person in charge must be an eternal optimist, and and lucky too. 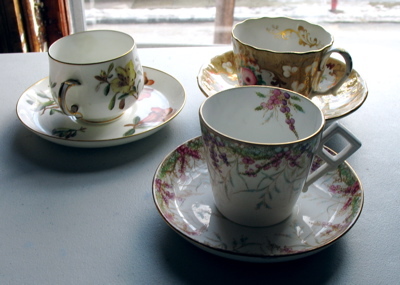 I’ve been on the look out for some tea cups to make some more pin cushions and was very pleased to find these. So, I was lucky also! It is amazing what a sunny, warmish (relatively) day, with spring in the air can do to lift the spirits. Even when you have to leap over icy, rock hard snow banks to cross the streets. We watched Bride and Prejudice last night- Fantastic! So, so funny- and as true to the story as most movies. I loved it enough that I might have to watch it again before it goes back. I keep thinking of funny scenes and laughing again! Here are some etsy shops where I’ve spent money recently- Novembermoon and Sara Lechner Fiberart. Beautiful artwork. Lots of comments on the hidden button hip joints- I will do a post to show what I’m talking about. I need to go take more photos though. What a good mix, I like the square handle on the pink one. Are these hard to find where you are? We received a DVD of “Bride & Prejudice” as a wedding gift and it is absolutely one of my favorites! I’ve lent it out numerous times and it always comes back with rave reviews. Your weekend sounds wonderful. Love the tea cups – look forward to the pin cushions! Such good finds and I love the pincushion idea!